Home NEWS Two women arrested for drugging and robbing people. Two women arrested for drugging and robbing people. The Directorate of Criminal Investigations (DCI) detectives on Friday arrested two women in Thika for allegedly drugging and robbing people. 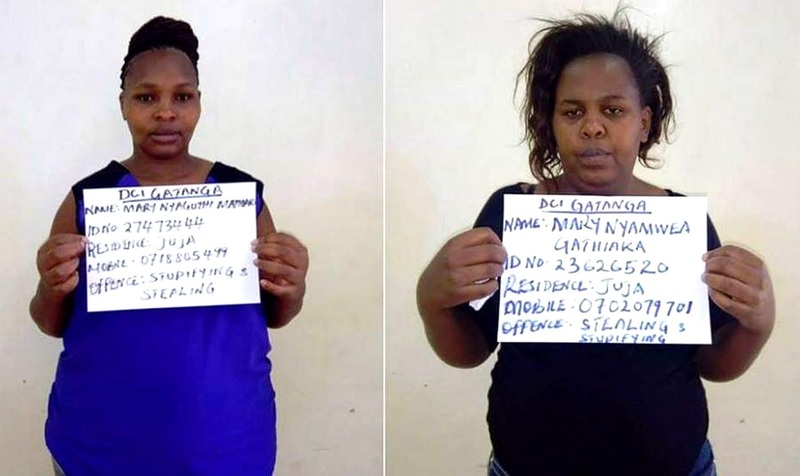 The suspects, Mary Nyaguthii Mathari and Mary Nyamwea Gathiaka were accused of drugging unsuspecting victims before robbing them off their valuables. During the operation, the detectives recovered tablets of Stilnox drugs used to stupefy people in clubs. Several SIM cards registered in different names were also recovered. Police believe they were used to withdraw money from the victims’ bank accounts. “Detectives working on intelligence Today arrested two ladies; Mary Nyaguthii Mathari and Mary Nyamwea Gathiaka in Thika for drugging unsuspecting victims before robbing them off. Several Tablets of Stilnox Drugs used to stupefy people in clubs & several SIM cards recovered,” said the DCI. The two suspects will be arraigned in court on Monday.